The reports on this page are those of the Integrated Support Teams (ISTs) which have been provided to SECTION27 and the Rural Health Advocacy Project (RHAP). 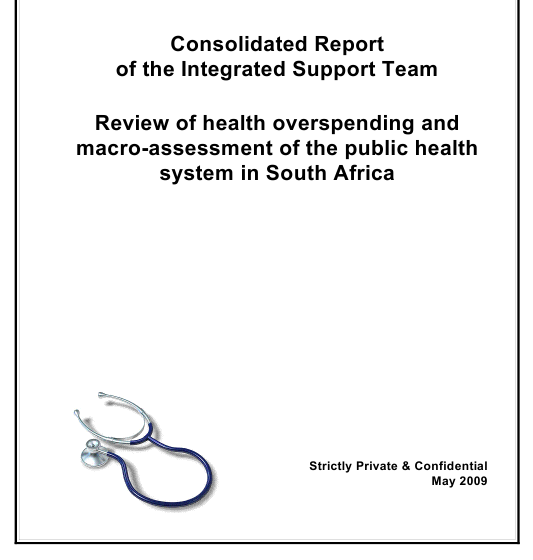 The IST reports were commissioned by the former Minister of Health, Barbara Hogan, in response to the massive budgetary shortfalls that over-whelmed provincial departments of health (PDoHs) in the 2008/2009 financial year, which reached crisis levels when the Free State Department of Health issued a moratorium on the initiation of new patients onto antiretroviral treatment from November 2008 to February 2009. 10 reports were commissioned in total, one for each provincial department of health and one for the National Department of Health – which we have not been able to access as of yet. In addition, a Consolidated Report was produced that pulled together findings from the individual department reports. 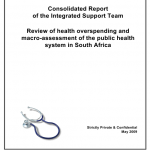 These reports contain an honest, sobering assessment of the inadequate financial capacity of provincial departments of health that have led to the development of over R7.5 billion in provincial debt as of April 2009. The findings in these reports reveal fundamental failures in political and bureaucratic leadership, inappropriate financial management systems, inadequate monitoring and evaluation systems, and a failure to plan appropriately for human resources, amongst others. The reports also contain detailed recommendations of what steps must be taken to resolve these systemic failings and assigns responsibility to implement the recommendations to the Minister of Health, the National Department of Health (NDoH), the PDoHs, National Treasury, provincial treasuries, the Department of Public Service and Administration and external stakeholders. These recommendations – if implemented – will go far towards developing a public health care system capable of achieving the right of access to health care services guaranteed in section 27 of the Constitution.